A long time ago, Leeds only had greasy spoon-type cafés , dodgy pubs, and the odd decent Italian, and that was about that. Then came Arts Cafe down on Call Lane. It served good food, good coffee, good wine, and a few decent bottled beers. It was a little bit – dare I say it – European. And people liked it. They liked it very much indeed. Other places like it started to spring up, and Leeds began to develop a proper, grown-up restaurant and café scene. I don’t think it’s unfair to say that Arts had a profound influence on the way that people eat out in Leeds today. Art’s was then, and it is now, just a lovely place to spend some time. It was perhaps inevitable that the people behind Art’s would want to spread their wings at some point, and that happened last year with the opening of Shears Yard around the corner on Wharf Street, in the building that housed Livebait in its several incarnations, not that it’s really recognisable as such today. The building has undergone a total refit, stripped back to the bare brick, revealing its former life as a warehouse of some sort, with a waist-high plinth of polished concrete cast against the walls, beams and girders open to the light that floods in through the large skylights. Industrial filament bulbs hang from a cat’s cradle of thick electrical cords, swung from the ceiling like miniature trapeze lines over beech tables and chairs. As a dining room, it looks fantastic – stylish, classical, but not intimidating or overbearing. It’s one of those buildings that just snaps into place, one of those places that I’d imagine the architect or designer walking into for the first time and feeling a certain sense of satisfaction at a job done very well indeed. This is all irrelevant if the staff are horrific and the food poor, though, and there are plenty of very handsome restaurants around that let themselves down by being, well, rubbish. This is emphatically not the case at Shears Yard. Not even one tiny bit. Let’s start with the food. I’m not one for hyperbole, as you probably know, but the main course I had the other night at Shears Yard was possibly one of the best plates of food I’ve had in any restaurant anywhere in the world, for years. It was that good. What makes that even more astonishing is that it was on the early bird menu, but I couldn’t see any corners whatsoever being cut in my meal – a chicken breast cooked perfectly, and presented immaculately with a salsa of sweetcorn and chorizo, with kale and roast corn on the cob in there for good measure. It was just delicious, and at £14.50 for two courses, or £17.50 for three, a complete bargain. 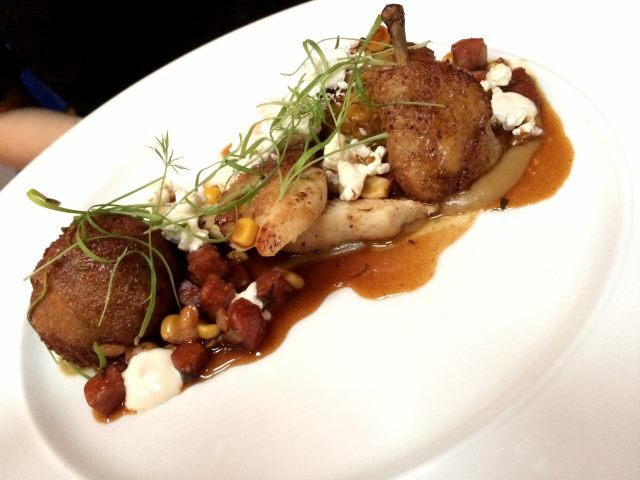 The rest of our food was of a similar standard – good, fresh ingredients cooked simply and elegantly. It’s modern food, with enough inventiveness to keep it interesting, but without veering too far away from the sort of things people actually want to eat. Nosing through the website, I caught sight of a joint of belly pork, roasted for twelve hours for Sunday lunch. Exactly. Service, too, was first-rate – friendly, warm, efficient, and really, it’s these things that knit the place together … a stunning building, some exceptionally good food, cooked and served by thoroughly nice people. This is an intoxicating blend of talent, composure, confidence and genuine warmth. 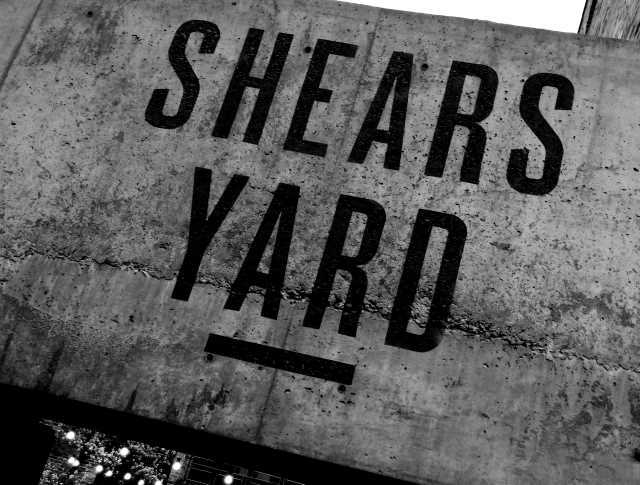 Shears Yard is good, they know they’re good, and they want to celebrate that with their customers. Art’s got it right in the nineties, and they’ve got it right again in 2014 with Shears Yard.